Posted by admin in activity reports, Argentina, Chaitén, Chile, eruptions, Planchón-Peteroa. Chilean state geological service SERNAGEOMIN has issued a new bulletin (4 October 2010) giving the latest information about the ongoing activity at Planchón-Peteroa and Chaitén volcanoes. The eruptive activity has remained constant in the south-western crater, with a relatively dense column of ash, gases and diffuse emanations of water vapour. The emission of ash and gases was maintained from the lower north-eastern edge of the crater, but it was more continuous and vigorous than was observed during the flights of 7 and 9 September. From the air, a column a little more dense than on those occasions could be observed. The ash column rising from the crater was inclined towards the east to a height of approximately 400 metres above the level of emission. From this point the column was dispersed and diluted over a wide area of Argentine territory. During the overflight, the greater part of the ash plume in suspension was distributed towards the east and, from there, a part towards the north-east, for tens of kilometres, at heights of up to 6000 metres a.s.l. A more dilute trace of the plume extended to the south and south-east at maximum altitudes of 3000 metres a.s.l. between Argentine valleys. 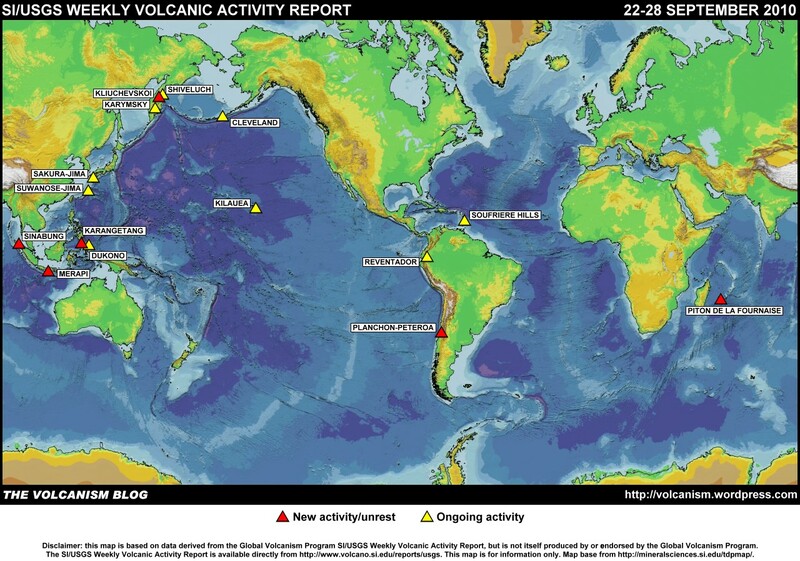 The report concludes that the volcano’s current behaviour suggests that ‘the magma body and the hydrothermal system are remaining in a certain equilibrium’. The alert level remains at Yellow level 4. A detailed version of the Planchón bulletin in PDF can be found by going to the ‘informes’ page on the horrible OVDAS website and clicking on Región del Maule (VII) Volcán Planchón-Peteroa in the list under ‘Informes, Reportes y Otros Informes’ for the list of recent reports, or you can open the PDF directly by clicking here. 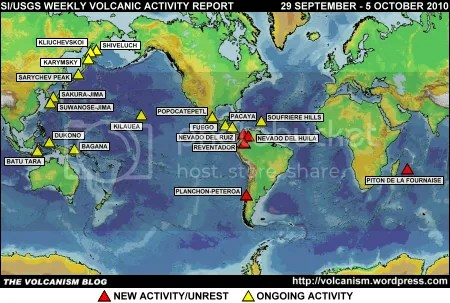 As for Chaitén, things remain active but quiet: a slight increase in seismic activity was registered during 20-28 September compared to levels earlier in the month, but ‘the energy released by the volcanic system remains at relatively low levels, comparable to earlier months’. SERNAGEOMIN is maintaining an alert level of Yellow level 3. Watching Planchón: the main page of the Proyecto Observación Volcán Villarrica (POVI) website currently features information on the Planchón activity, and SERNAGEOMIN-OVDAS has a webcam at Romeral which provides a very good view of Planchón-Peteroa, weather permitting. Posted by admin in activity reports, Argentina, Chile, eruptions, Planchón-Peteroa. Press reports this morning say that the authorities in Argentina have put out a yellow alert for Planchón-Peteroa volcano on the Argentine-Chilean border. An eruption which began on 18 September has produced a dense dark plume and ashfall across Argentine territory, and reports say that the volcano is increasing its activity. No evacuation has been ordered for nearby areas, but local inhabitants have been warned to take precautions against any increase in the ashfall. The NASA Earth Observatory has a satellite image captured on 18 September of Planchón-Peteroa’s plume, which certainly looks very dark and ashy as it blows across Argentina (H/T: Eruptions). UPDATE. Officials in Argentina now deny that any yellow alert has been applied to Peteroa, says the latest report in Diario Los Andes. However, both Chile and Argentina are continuing to monitor the volcano, the activity of which is described by Argentine geologists as ‘above normal’. There has been with light ashfall in areas affected by Peteroa’s plume, and a strong smell of sulphur has been reported. On the Argentine side of the border smallholders raise sheep and cattle in the area around the volcano, and there are concerns that they may be affected by the volcano’s emissions. Posted by admin in Chile, Planchón-Peteroa, volcano monitoring. SERNAGEOMIN now has a webcam monitoring the recently-active Planchón-Peteroa volcano on the Chile/Argentina border. The camera can be accessed via the OVDAS main page (the link is on the left, at the bottom), or by means of this direct link. Thanks to commenter Rubén for this tip.